It has been a long time since I have done a feature spot like this. If you are a longtime follower you might remember back over the winter when I had done my very first feature. I brought her back again to kick off the summer. Amy Jo is a very dear friend of mine, who has just recently moved back to Wisconsin. I am so excited to have her so close to me again. She is such a beautiful and talented person with a heart bigger than Texas. She spends as much of her free time doing the things she loves and always with a smile on her face. I can't wait till the next time I get to spend some quality yarn time with her. I just love what she has done with this piece. Between the colors and the crisp lines I think anyone would love this afghan. I used a simple corner to corner pattern and improvised a HDC/slip stich/ DC border. This is one of my favorite ways to work. With this pattern, you work to the middle and then its downhill work from there. I was using left over scraps and some full skeins of Vanna's Choice. http://www.lionbrand.com/yarns/vannaschoice.html I found the yarn just ok to work with. A bit above the scratchy-ness of Red Heart Super Saver. It does offer a large variety of color choices decently priced for those on a budget. Mine I actually found at $1.50 to $2 on sale at a variety of places. With all of the purple, I intended it to be a more feminine blanket, but as I went along and with the color choices it also presented a masculinity, so its suitable (I think...) for any gender or for the parent who is not so fond of the pastel baby colors! It measures at about 28x28 inches and is machine wash and dryable. I don't have a particular inspiration sometimes when I work, just making something that I would be proud to share and with love and good intentions for the recipient, although I may not know at the time who it will belong to. This particular piece is available in my etsy shop (http://www.etsy.com/people/HugsbyAmyJo?ref=pr_profile ) which I am getting back up and running. Although, summertime isn't exactly the time of year for 'winter wares'. Next on the hooks, a summery star afghan out of Bernat Baby Sport which is nice and soft and light and perfect for summer crafting! Follow my progress at http://www.ravelry.com/people/AmyJoPeters. I always love to hear from my readers. What is your favorite part of this beautiful afghan? 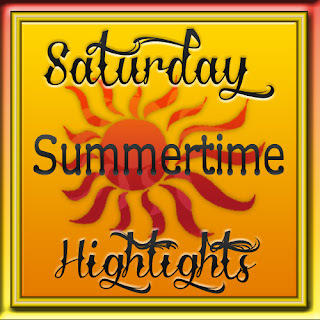 If you have an item that you would like to see featured during our summer feature event then please email me at smalltowndreamz@gmail.com Subject "Summertime Highlights"